Apartments provide monthly income and may appreciate in value over the years. 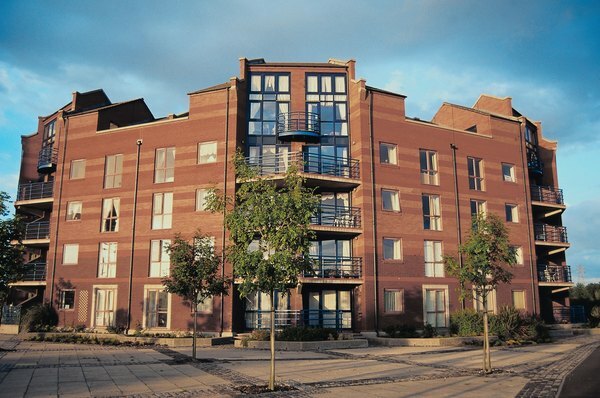 Investing in apartments can give you a steady monthly income with minimal effort. If you decide to hire a property management company, the entire operation can be completely hands-off after the initial effort of finding and purchasing the apartment. Preparation is the key to making money investing in apartments. If you buy the property at the wrong price, it will be almost impossible to turn a profit. Start with your local classified ads and Craigslist for smaller developments. Large complex owners may prefer to work with a real estate agent so they do not have to hassle with locating buyers, running credit checks, taking deposits and writing up a sales contract. An agent can make sure potential buyers are serious and not wasting the owner's time with questions. Gather financial data for the complex, preferably over a period of several years. Ask for the current rental income, vacancy rate and a rent roll showing tenant names and lease expiration dates. Try to get actual repair and maintenance expenses, if possible. Use an estimate based on the other apartment complexes in your area if the actual numbers are not available. For most properties, 35 percent to 45 percent of monthly rent is a safe estimate. It is best to have your financing in place before making an offer on the apartment, especially if the property is in high demand. Contact lenders as soon as you have a rough estimate of the amount you will need to purchase the property. You may need to put down as much as 20 percent, depending on the lending market in your area. It will take time for the lender to process your application. The lender also may request more information to verify your income, delaying the process even more. Look at comparable sales in the neighborhood and the length of time the apartment has been on the market. You can offer less if the owner has not been able to sell it for a long time. A cashier's check or money order is typically required as a nonrefundable deposit when you make your offer. You will receive a refund if the sale falls through because of the owner's negligence, fraud or misrepresentation. Decide whether you will manage the property or hire a company to do it for you. Factor the management costs into your income projections. It may not be worth the expense until you have multiple units to oversee. Property management fees typically range from 5 percent to 10 percent of the apartment's monthly rent, depending on the type of services the management company will perform for you. Most property management companies will collect the rent from your tenant, which can be especially helpful if you live in a different city or if the property is in a part of town where you do not feel safe. REIClub.com: Why Invest in Apartment Buildings?